This precious pooch is all set for the holidays with his festive bowl and dog house all decked out for celebration. 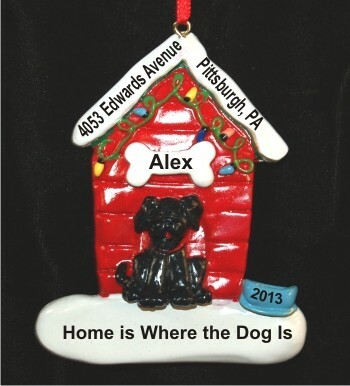 Personalize this dog ornament with your dog's name, the year, and your custom sentiment. Our Black Dog with Holiday Dog House ornament measures 3.5"H, and arrives nestled in our Christmas pouch.